On 1 July 1996, the new Domestic Violence Act came into force, bringing a raft of changes which extended the definition of violence and increased the powers of the state to intervene in private lives. In one of the first applications of the new Act, the North Shore Family Court granted protection orders to the police on behalf of a 20-year-old woman, but without her knowledge. This allowed the police to go to her home and force her partner to leave, without notice and against her wishes, because they feared that she was not safe living with him. Stephen Worth was subsequently prosecuted for assault, despite the fact that his girlfriend refused to testify against him. The police had asked her to sign a 'victim impact report' and this was used as evidence against him. Mana Men's Rights Group Submission to the Social Services Select Committee. 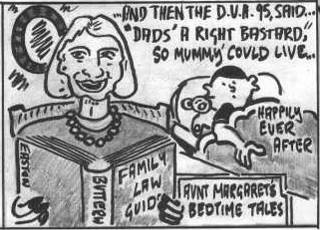 "Our system in the Family Court process and accompanying social support agencies is an adversarial system. This pits two sides against each other in a winner takes all scramble for the spoils of battle which is money, possessions and of course children. Add to this cauldron such mechanisms as the Domestic Violence Act (the allegation industry) and you now have a recipe which will see some people sentenced to life under a Domestic Protection Order, alienated from their children, bitter and angry for years into the future; and the other living with the illusion someone is protecting them until the reality hits home that a Domestic Protection Order is just a piece of paper, and that the police can't watch and protect you, and the court will not and cannot protect you, and it is the goodwill of the 'perpetrator'; nothing else." Fiction In The Family Court In the May 2001 edition of New Zealand Lawyer magazine, lawyer Terry Carson reveals how the Family Court offers great opportunities for budding fiction writers. He says the main rule for drafting applications for temporary protection orders is to use plenty of adjectives and adverbs. It is much more effective for an applicant client not merely to be hit but to be "heavily punched". A fall during the course of a scuffle is more impressive if it is described as "the respondent violently threw me to the floor". If the respondent uses a few swear words during a verbal argument refer to it in the affidavit as being "a torrent of obscene abuse." It will catch the Judge's eye better that way. The Citizen's Advice Bureau has a simple explanation of the New Zealand legislation.